There are still a few bits that look nice at close range. 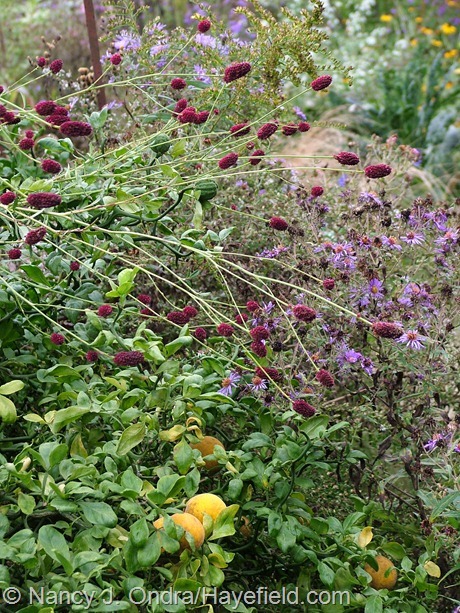 Above, great burnet (Sanguisorba officinalis) with ‘Magilla Purple’ perilla (Perilla), with ‘Elephant Head’ amaranth in the background. 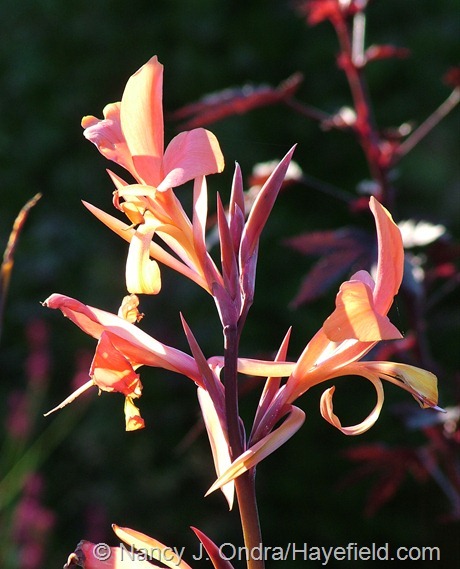 Below, the flowers of ‘Intrigue’ canna. 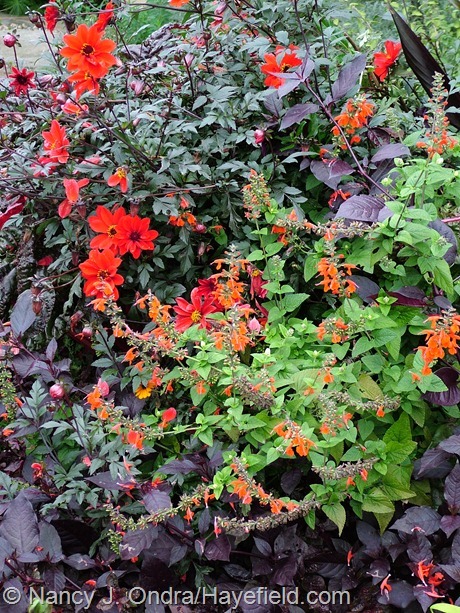 Above, ‘Bishop of Llandaff’ dahlia with ‘Lady in Red’ hummingbird sage (Salvia coccinea) and ‘Purple Knight’ alternanthera (Alternanthera dentata). 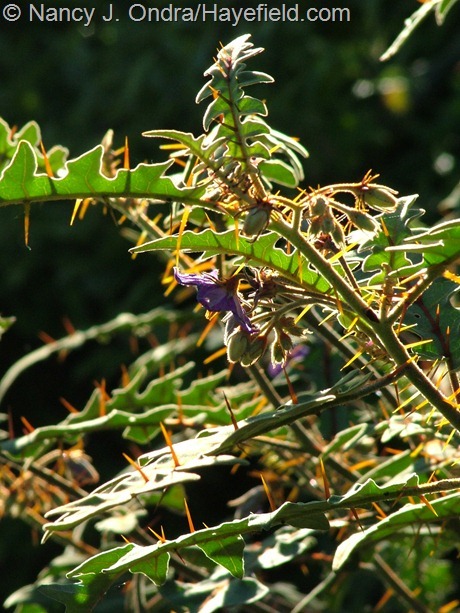 Below, porcupine tomato (Solanum pyracanthum). 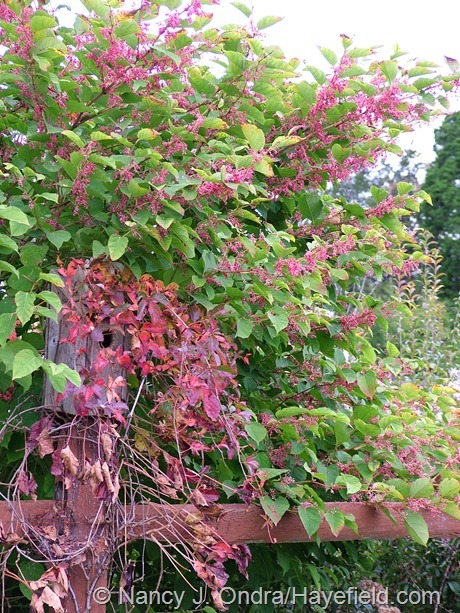 Above, ‘Crimson Beauty’ fleeceflower (Persicaria) with fall-colored Virginia creeper (Parthenocissus quinquefolia). 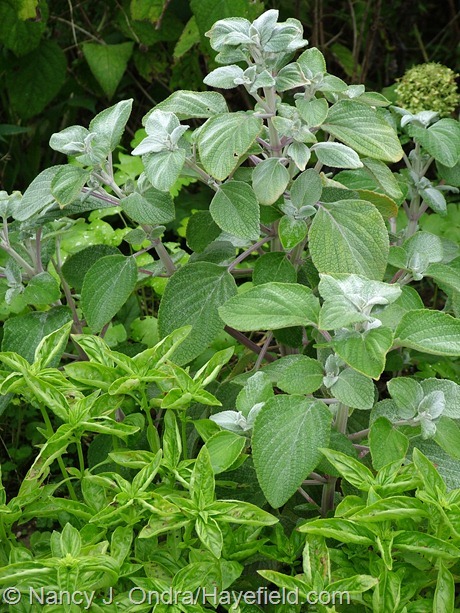 Below, silver spurflower (Plectranthus argenteus) with sweet basil (Ocimum basilicum). Above, ‘Swift Creek’ Chinese privet (Ligustrum sinense) with ‘Harrington’s Pink’ New England aster (Symphyotrichum novae-angliae). 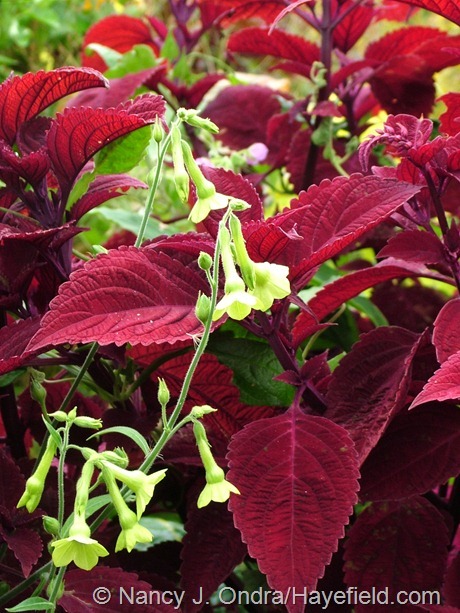 Below, ‘Ondra’s Green Mix’ nicotiana with ‘Big Red Judy’ coleus. By this time of year, there’s some sprawling going on, producing vignettes that are a little difficult to make sense of visually but still pretty. 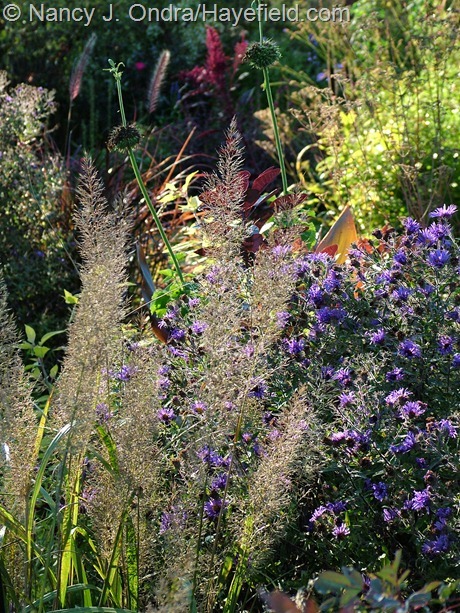 Above is ‘Longin’ Russian sage (Perovskia) with New England and aromatic asters (Symphyotrichum novae-angliae and S. oblongifolium). 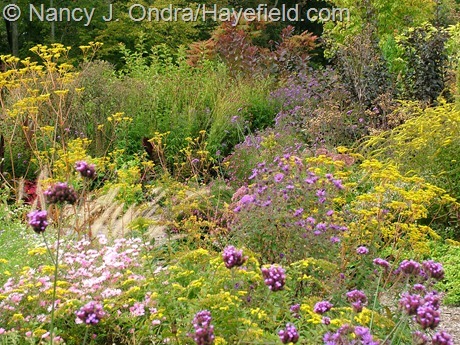 Below, a spray of ‘Dali Marble’ burnet (Sanguisorba menziesii) keeled over onto ‘Flying Dragon’ hardy orange (Poncirus trifoliata) and New England aster. 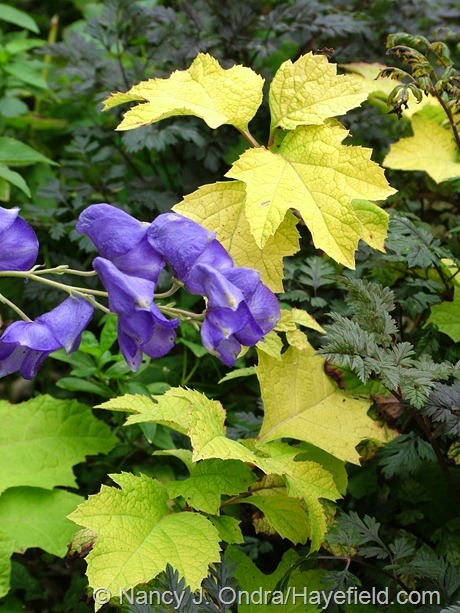 Above, a bit of azure monkshood (Aconitum carmichaelii) that’s fallen onto ‘Little Honey’ oakleaf hydrangea (Hydrangea quercifolia) and ‘Ravenswing’ cow parsley (Anthriscus sylvestris). 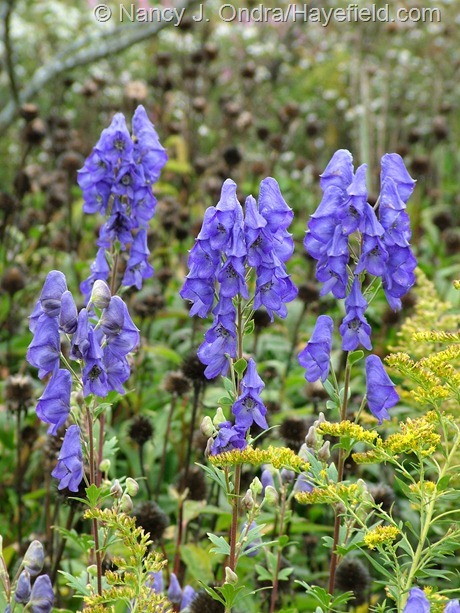 Below, properly upright azure monkshood with a bit of Canada goldenrod (Solidago canadensis) against purple coneflower (Echinacea purpurea) seedheads. 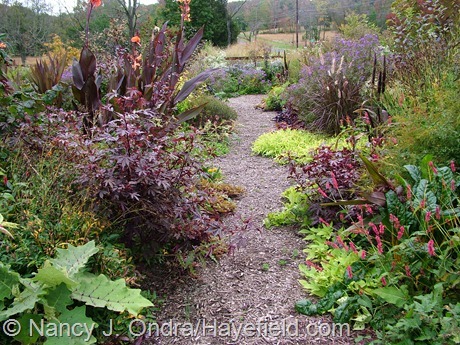 Above, ‘Nero di Toscana’ kale with fountain grass (Pennisetum alopecuroides), lantana, and the foliage of yellow baptisia (Baptisia sphaerocarpa). Below, Tatarian aster (Aster tataricus) with the seedheads of Carolina lupine (Thermopsis villosa). 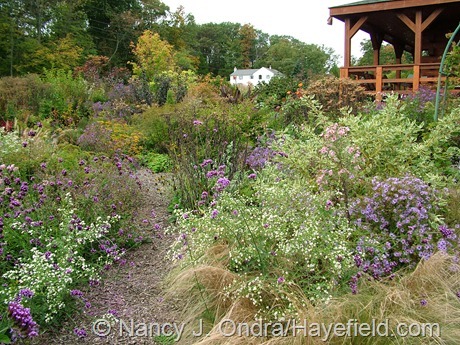 Above, frost aster (Symphyotrichum pilosum) with some purple New England aster (S. novae-angliae) and Brazilian vervain (Verbena bonariensis). 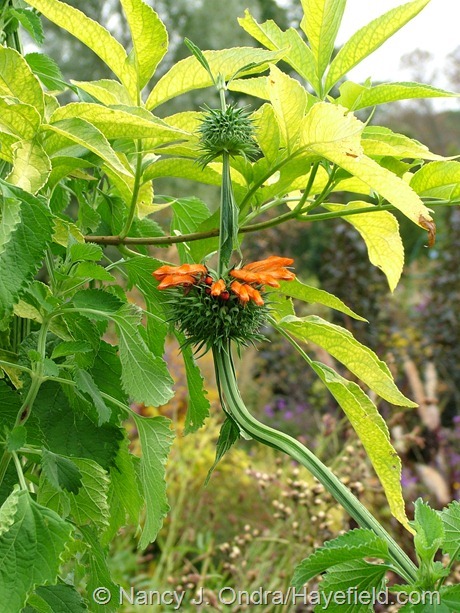 Below, ‘Staircase’ lion’s ear (Leonotis nepetifolia) with golden elderberry (Sambucus nigra ‘Aurea’). 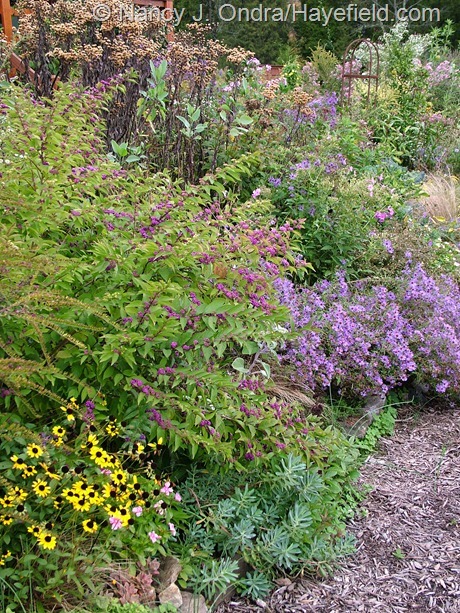 Above, ‘Issai’ purple beautyberry (Callicarpa dichotoma) with orange coneflowers (Rudbeckia), Euphorbia nicaeensis foliage, aromatic aster (Symphyotrichum oblongifolium), and ironweed (Vernonia) seedheads. 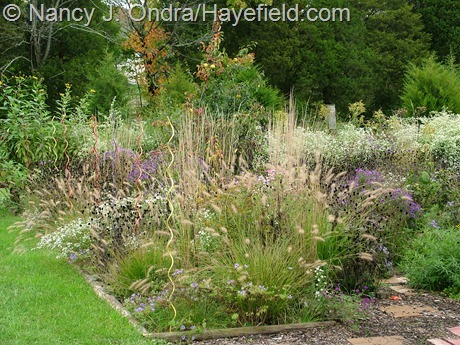 Below, Korean feather reed grass (Calamagrostis brachytricha) with ‘Hella Lacy’ New England aster (Symphyotrichum novae-angliae) and the seedheads of ‘Staircase’ lion’s ear (Leonotis nepetifolia). 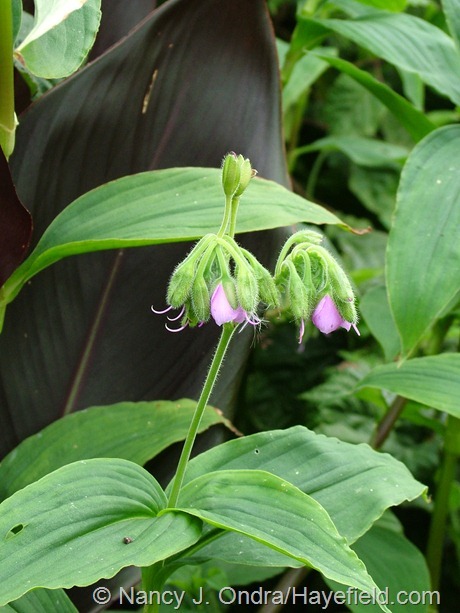 Above, widow’s tears (Tinantia erecta). 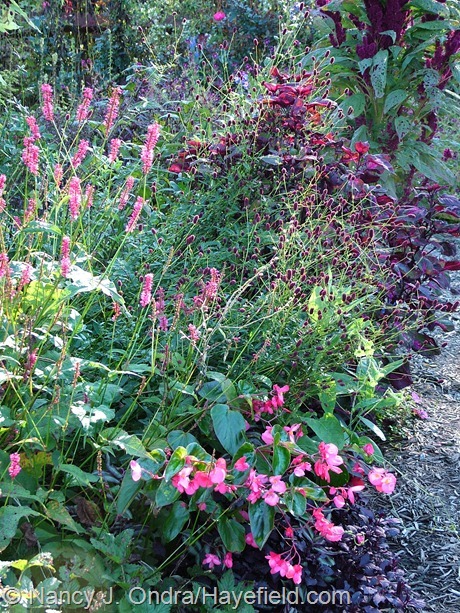 Below, ‘Taurus’ mountain fleeceflower (Persicaria amplexicaulis) with ‘Dragon Wing Pink’ begonia, great burnet (Sanguisorba officinalis) and ‘Magilla Purple’ perilla (Perilla). Above, ‘Australia’ canna, ‘Bishop of Llandaff’ dahlia, ‘Bright Lights’ Swiss chard, and ‘Angelina’ sedum (Sedum rupestre). Stepping back a bit tends to produce more flattering pictures for most parts of the garden. 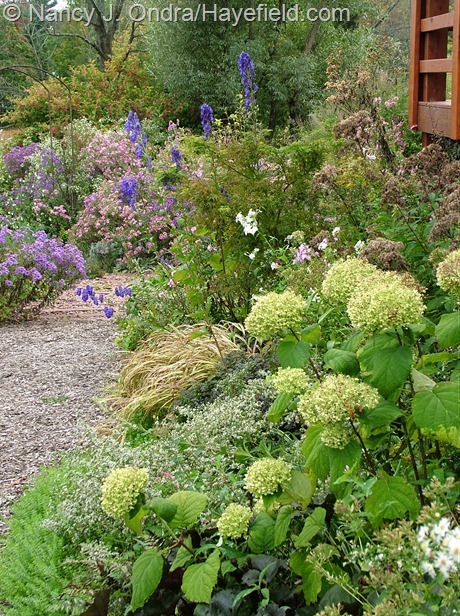 Below, part of the Viburnum Border. 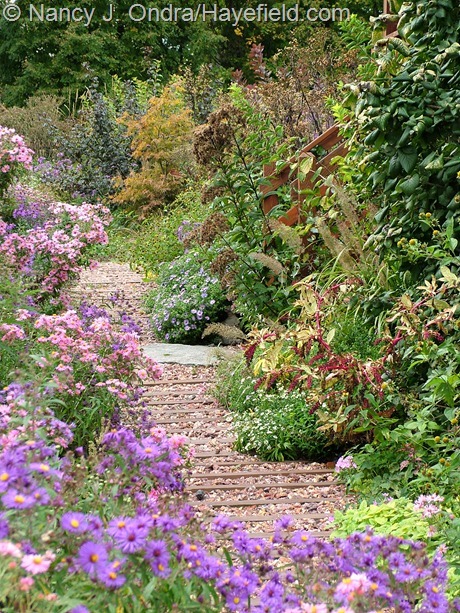 Above and below, the middle path in the front garden, taken from opposite ends. Above, the path the separates the front and side gardens. Below, an overview of the side garden, as seen from the porch. From up here, it looks rather meadow-like. Down at ground level, the paths are apparent, so the garden-y effect comes back. 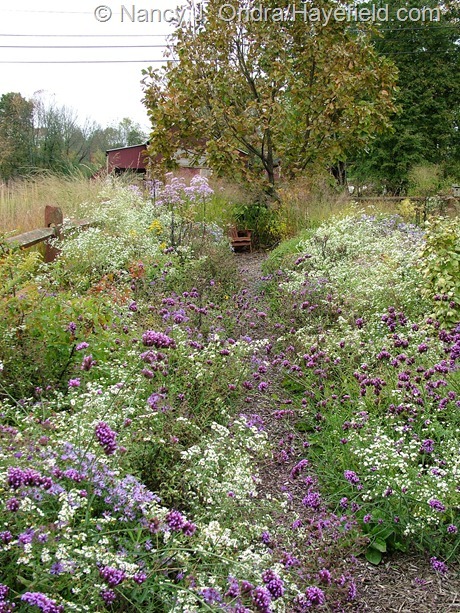 Below are two sides of the middle path through the side garden. Below, more views of the side garden. Below, some shots from out back. 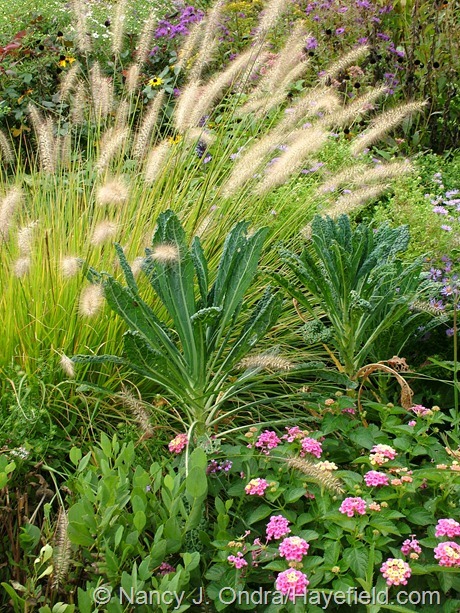 Some plantings out in The Shrubbery…above, ‘Cassian’ fountain grass (Pennisetum alopecuroides), Tatarian aster (Aster tataricus), ‘The Blues’ little bluestem (Schizachyrium scoparium), and ‘Dewey Blue’ bitter switch grass (Panicum amarum). 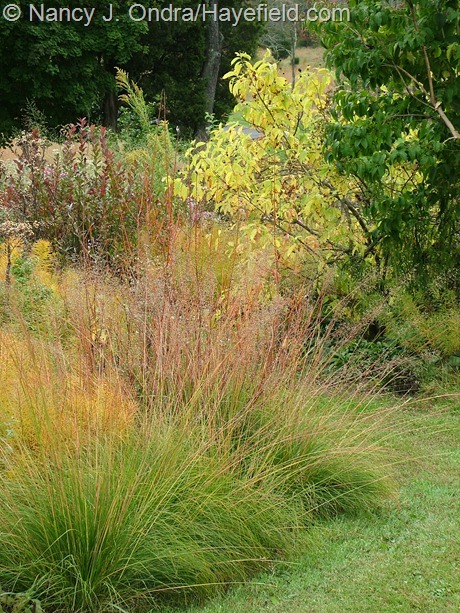 Below, prairie dropseed (Sporobolus heterolepis), the red stems of coral bark willow (Salix alba ‘Britzensis’), and the fall color of buttonbush (Cephalanthus occidentalis). 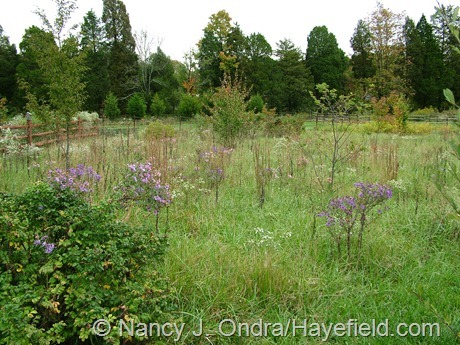 Above, pink and purple New England asters (Symphyotrichum novae-angliae) are finally seeding into the meadow. 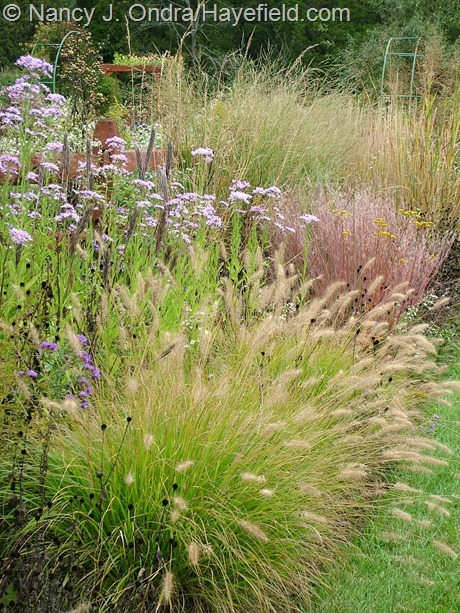 Below, part of the Arc Borders: ‘Cassian’ fountain grass (Pennisetum alopecuroides), frost grass (Spodiopogon sibiricus), and – in the back left – ‘Cloud Nine’ switch grass (Panicum virgatum). Well, that’s it for the last Hayefield Bloom Day of this year. 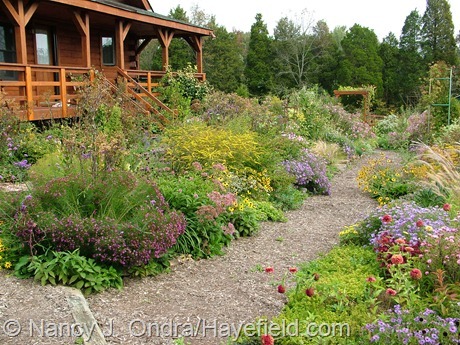 To enjoy what October has to offer in other gardens all around the world, check out Carol’s main Garden Bloggers’ Bloom Day post at May Dreams Gardens. 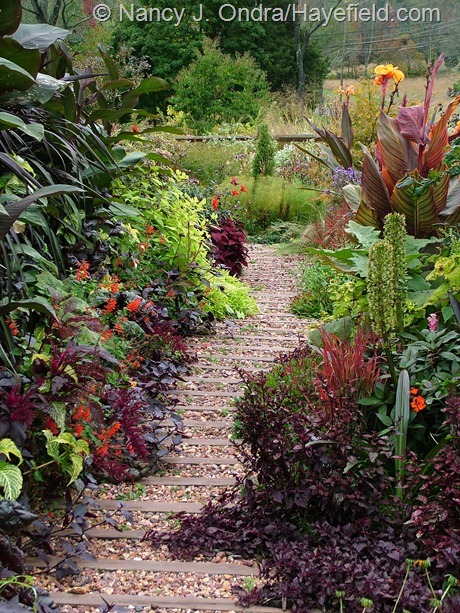 As always, stunning pictures and glorious plants. 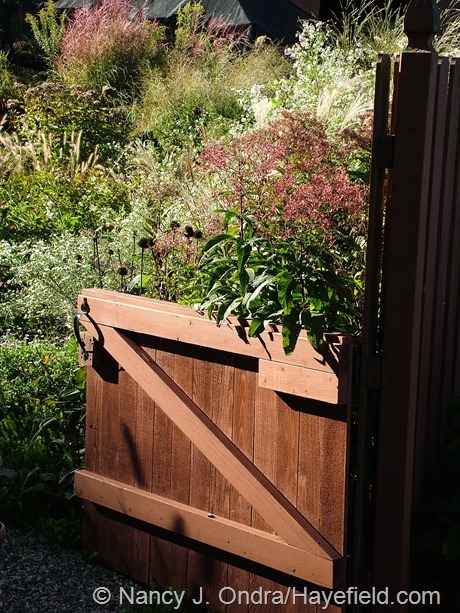 I really liked the Brazilian vervain with that iron gate and the red gazing ball with ‘Bright Lights’ Swiss Chard. 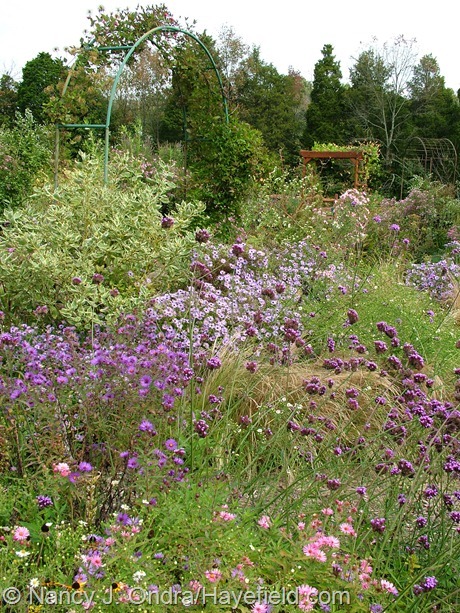 Brazilian vervain self-sows for me in zone 5 and I just love it with the orange of pumpkins. I enjoy your posts. Hi there, Sandi. I bet you got even more of a freeze than we did the other night. Hard to believe that we were back to the 60s last night. I’ve noticed that Verbena bonariensis has started to overwinter here over the past four or five years; in a few more, maybe it will be hardy for you too. I can image it looks great with orange! I feel the mood and love the beauty of your photos. Thanks so much for sharing! 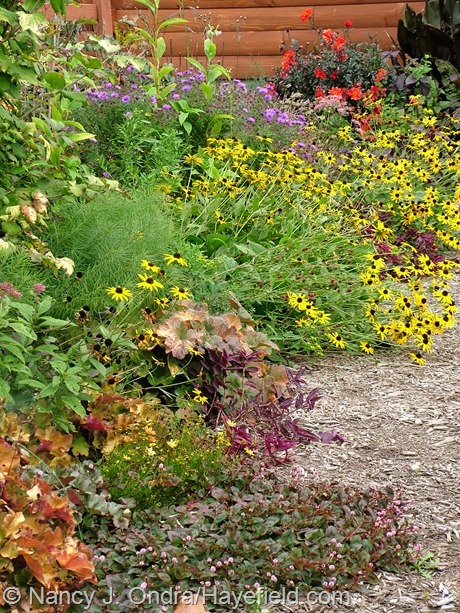 I already miss the rich and bright colors of the annuals and tender perennials, but to be honest, things were getting a little boring, so it’s exciting to start thinking about next year. Thanks for visiting, Shenandoah! What a beautiful garden you have! I look forward to spending time reading and enjoying each blog post. I wondered how your Little Honey hydrangea has done for you? I bought mine about three years ago as a tiny rooted cutting. While it’s grown some and I love the foliage, mine has yet to bloom. Thanks, Mary! My ‘Little Honey’ was at the same stage as yours when I planted it 5 or 6 years ago, and it’s now just about 1 foot tall. It has never flowered. At this point, I’m just glad to find it still alive each spring. 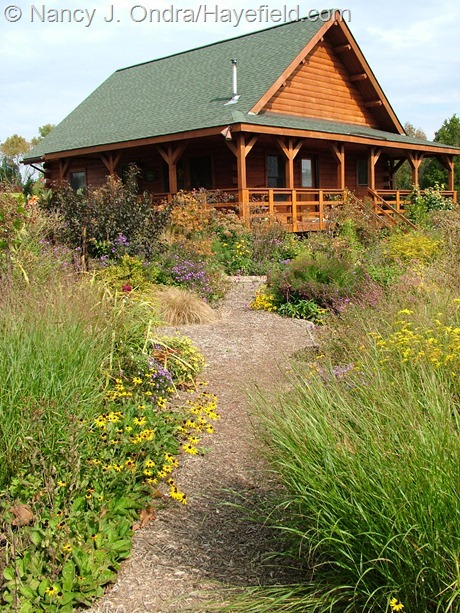 I think yours is my favorite garden in all the land. Gorgeous, as always! I hope your own garden is your real favorite, Heather, but I’d be honored to be your second favorite. Happy Bloom Day to you! Overwhelming. I must say it was my favorite tour yet. I just love the meadow look. Thanks! That’s so nice to hear, Greggo. I was afraid that it would be too similar to last month. Now we can rest up and look forward to next year. Nan, I’m struck by how much movement there seems to be in these photos of your garden. Everything seems to be swaying and tossing in some gentle breeze. 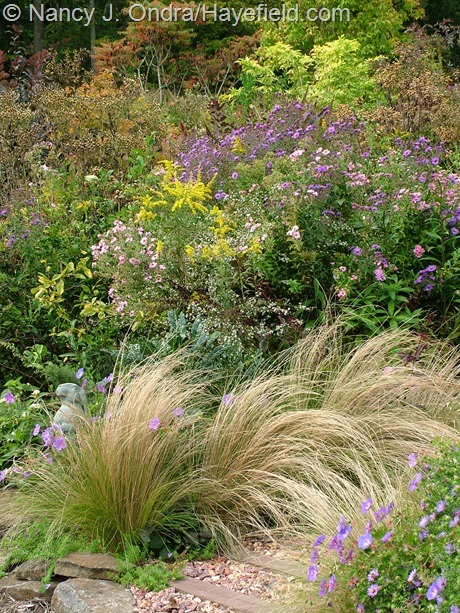 The grasses and asters are positively billowy. 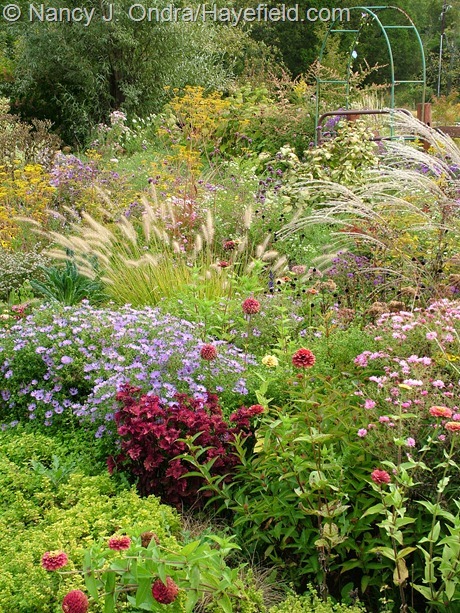 This is such a great time of year to enjoy a garden like yours. I hope you have crickets singing in your borders like I do. 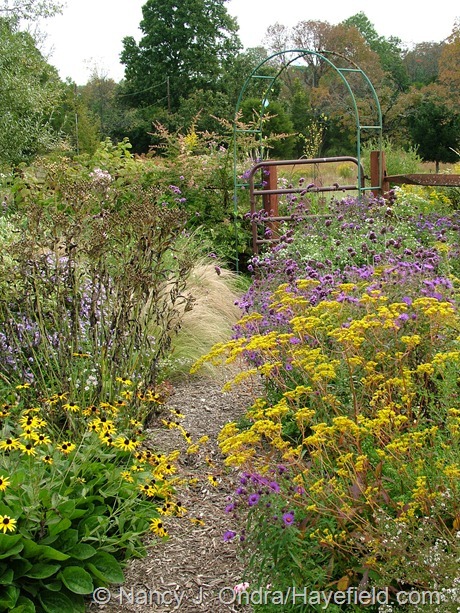 Its such a cheerful sound and for me elicits many pleasant memories of working in my fall beds at the end of the growing season. I love the huge kale plants this time! They really did well this year but the stars of show are the asters for sure. 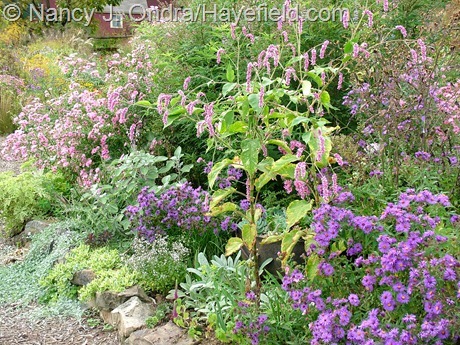 I also admire all the dark purple and have resolved to add Canna ‘Australia’ to my border next year. I’m not surprised that the plants look a bit tousled, Kate – I took many of the photos the day before the frost came at night, and it was very breezy that day. The crickets are pretty quiet now, but they were certainly abundant before it got so cool. 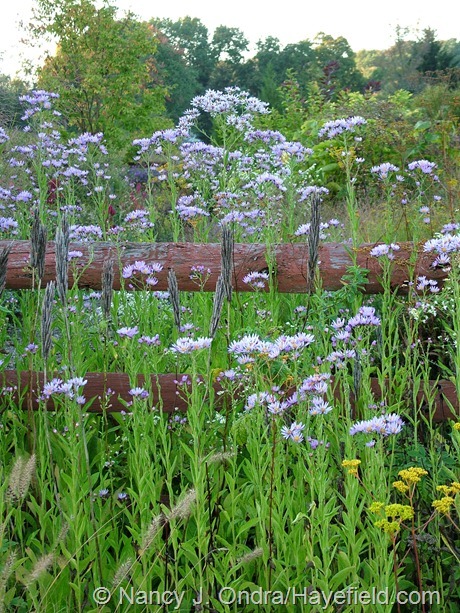 And yes, the asters are certainly the stars of this Bloom Day! My word, Nan, where do you get the time? Such beautiful flowers. I have now become a big canna fan ( since I am finally successful growing them). Also love dahlias. I have a pack of Leonotis from Baker Creek seeds I need to plant out-spent the last two weeks starting the veggie and herb seeds. I also have the seeds you had sent me, in the refrigerator, waiting for this month when the weather turns cooler to sow. The garden hardly needs me at all this time of year, Nicole; I’m basically just a spectator until cleanup time. 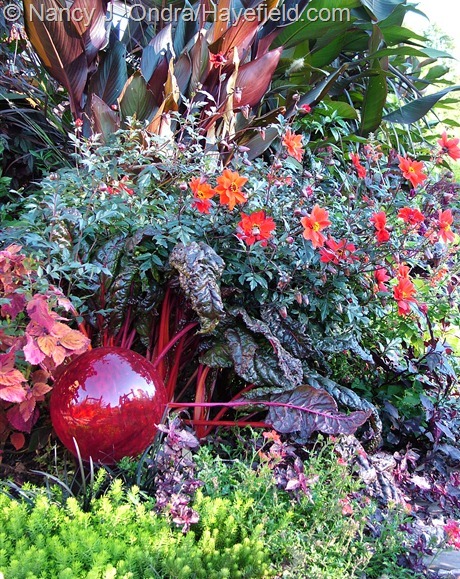 I bet cannas and dahlias look great in your garden. Thanks for the tip about Baker Creek for the Leonotis seeds! Thanks, Kristy! Those spirals are actually tomato stakes from Gardener’s Supply Company, but I never had much luck with them for that purpose, so they have a new life as fun garden accents. I recently discovered your blog and have since been enjoying a leisurely “stroll” through your archived posts. 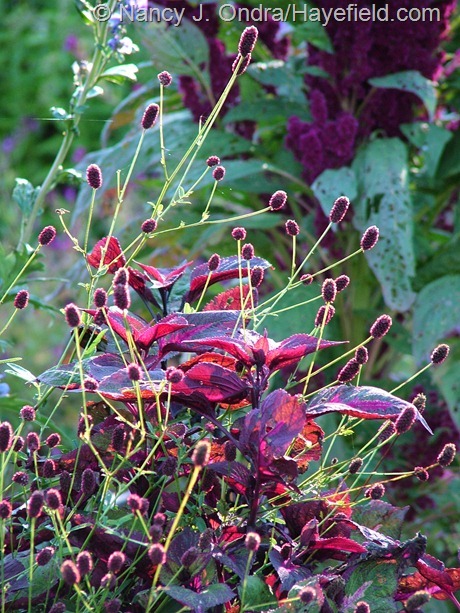 Your plant combinations are inspired, and your photographs capture them beautifully. 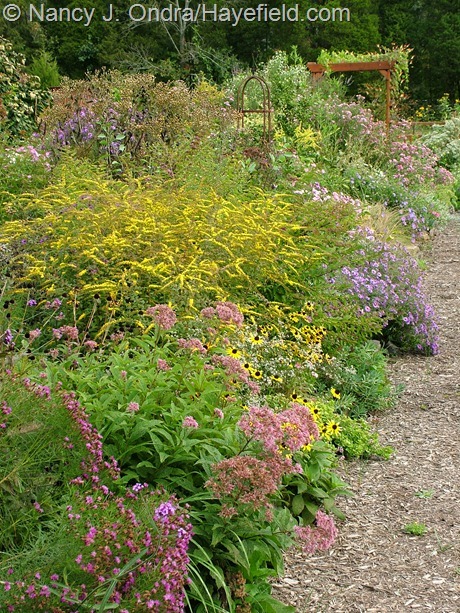 I am curious about one thing– you mention occasionally that your garden tends to be wet in the winter, yet you seem to have no trouble with things like Asclepias tuberosa, Eryngium yuccifolium, Sporobolus heterolepis, etc. which in my experience demand nothing less than perfect drainage. What’s your secret? Oh… and thank you for consistently including the botanical names for the plants. Very helpful! Hi there, Edward. Thanks so much for letting me know that you find the posts interesting. 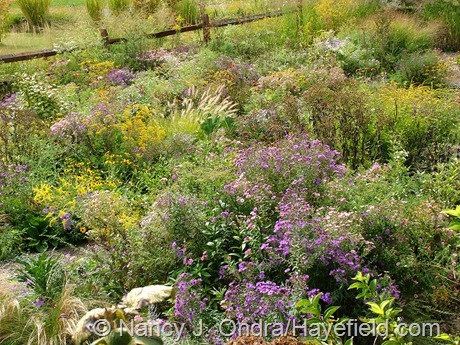 I find it endless baffling why plants that should thrive here sometimes don’t, and those that shouldn’t sometimes do. It would be so much easier if the plants would read the books, so they’d know where they were supposed to grow! I never had luck with Asclepias tuberosa that I’ve planted in the garden, but it happily grows in the meadow areas, where it has come up on its own. I planted the Eryngium yuccifolium in a dry spot out front, and it seeded into the very wettest part of the meadow. 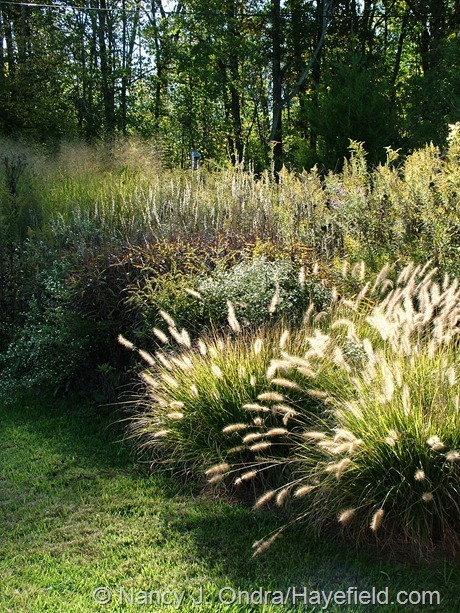 And the Sporobolus…well, it grows pretty much anywhere I put it, though it doesn’t self-sow (yet, anyway). Nan, I’m always speechless with your posts. I got the same cold-snap over here in northern New Jersey. Sad thing is that I was away from home [I was an exhibitor @ New York Comic Con… >D] and wasn’t able to properly protect/save my poor babies! I’m pretty sure most of them are dead, I do grow a korean Shiso/Perilla plant [unknown type, they’re literally my mother’s true heirloom!] where the lower leaves are *still* healthy, so I’m hoping those flowers will at least give me some more seeds. 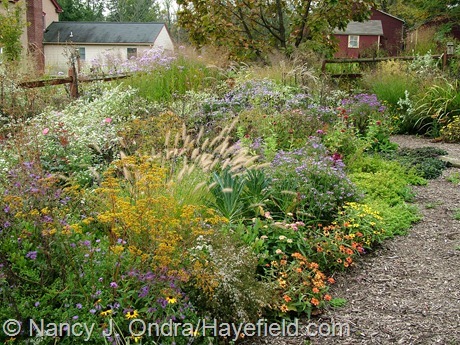 I won’t lose it though, my mother in warmer Delaware always has plenty of seeds to sow next year. 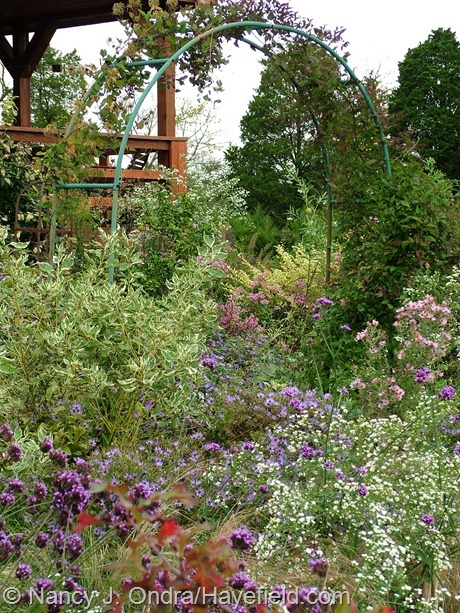 Although all of the hard work I put into some of my more tender annuals though has been all for moot. First year growing Exotic Love Vine (Ipomoea lobata) and I lost all of the flowers and upper growth – but I’ll keep growing it! What a lovely flower! Hey, Donna! I’m pretty sure it’s almost impossible to lose that type of perilla once you have it, so I bet you’ll be ok. I’m usually lucky to get 3 or 4 weeks of bloom from my Mina/Ipomoea lobata, but I too think it’s worth growing. I hope you’ll still be able to enjoy your garden for a few weeks yet. I’ll be covering fall colors in my next post, and in mid-November, I plan to do my seed-offering post instead of Bloom Day. I’d better get back to cleaning seeds! EUREKA! That’s right! Your seed post! I will need to replenish my supply of the Varigated Pokeweed [I lost all four seedlings, /cry!] if you have any left! I am going to wintersow the three I have still this weekend, and try again next year! 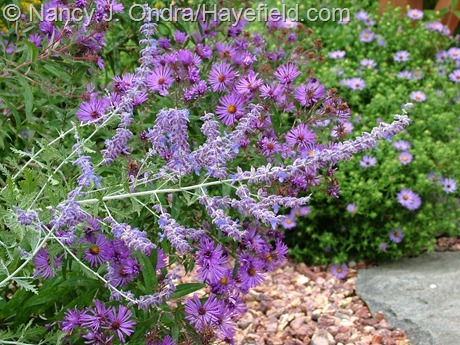 Now, I don’t recall if you offered them last time, but are your Asters also going to be available in the seed post? I have a newfound love for fall blooming asters [especially of the native variety!] and have relocated a bunch in my backyard into my front yard mini “flower meadow”. I’ll make sure I grab some pokeweed seeds for you, Donna. 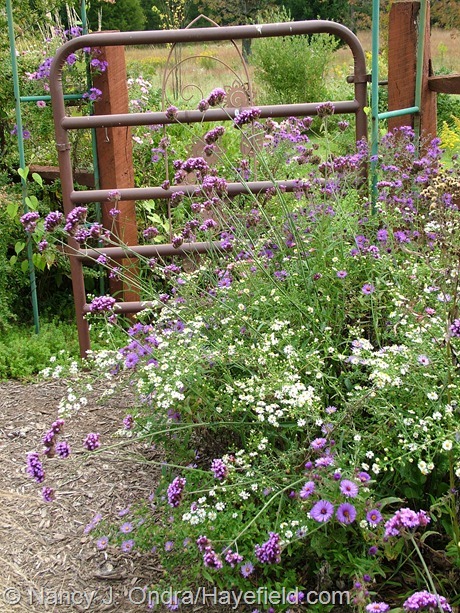 I’d be glad to collect seeds of the native asters I have, too. Feel free to email me directly at nan at hayefield dot com to let me know which ones you’re interested in. You continue to inspire. Great combinations and unbelievable color. Just wonderful. Thanks, Layanee. I thought that was going to be the last hurrah of the season, but our fall colors are coming along nicely in the last few days. I hope you are having a beautiful fall too! Beautiful, as always. We got the same hard freeze here in the Catskills (down to 19!) and then only a low in the 40’s the next few nights. My Honorine Jobert anemones were at peak bloom but just blackened stems remained the next day. Other casualties too of course, but those were such a bright spot by the front gate. I just found Great Burnet at a 75% off sale here, and snapped up both big pots of it. I couldn’t remember where I had seen it, and why I was so sure it will be fabulous. And then I came back to your blog, and said oh yes, now I remember where I saw it. Hey, Deborah. 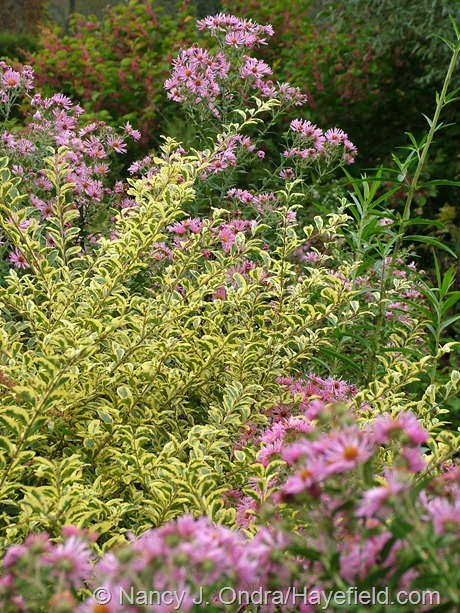 Yes, Canada goldenrod is an aggressive spreader here too, but I manage it in the garden the same way I do the asters that seed in: I pull out every bit I can find in spring to midsummer, let the few that I inevitably miss stay until bloom time, and then pull them out after they flower. I’ve had Anthriscus ‘Ravenswing’ for 10 or 15 years now. I generally cut off the stalks after bloom but leave one or two bits if I want replacement seedlings. It takes just a few minutes to do that simple maintenance if the self-sowing worries you. Enjoy your burnets! I find that they can take a few years to settle in after being moved , but then they just keep getting better. I completely agree with you, Kim. With their slender petals and pastel coloring, the flowers of ‘Intrigue’ are rather more elegant than those of most cannas. Not that I have anything gaudy, of course! what a paradise you have created! It does feel like a haven to me, Hoov. Thanks for visiting! Beautiful colors, shapes and textures. 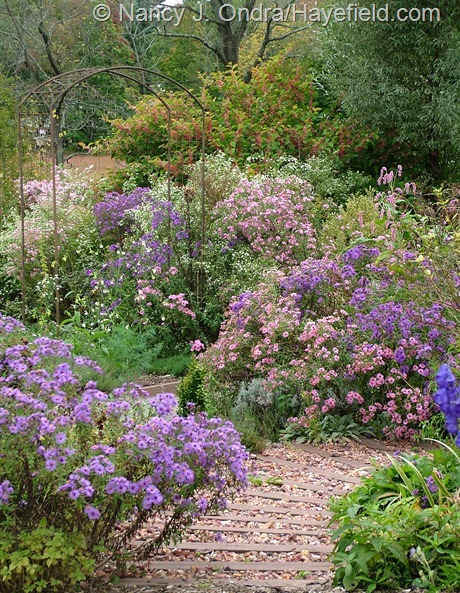 I’ve just added ‘Crimson Beauty’ fleeceflower, and Carolina lupine to my must-have list for spring. You’re garden is so colorful and very spring-like with all the pastels you brought together. Really good design. Thank you for the lovely comments, Lorraine. 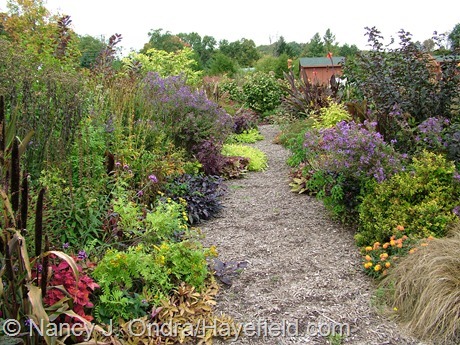 I wish you a great gardening season next spring!